The take-home message from a warmist love-fest at the Perth Writers Festival last weekend: WA’s looming Senate by-election could be the tipping-point for domestic – and possibly even international – climate politics and policies. Indeed, the planet’s only hope resides with the Greens, plus Spider-Man and a few other super-heroes, who are to capture the high moral ground and win at least one seat from the Prime Heretic and his band of denialist reactionaries, fossil-fuel purveyors and billionaire banditos. Asking the weather gods to inflict misfortune on others to achieve a desired political outcome takes a special kind of chutzpah. To do so while claiming to save the proletariat from alleged catastrophe while simultaneously ignoring evidence that would expose the lunacy of current climate policy requires the ethical dexterity of a grand master of spin – or a Spider-Man. Nevertheless Senator Scott “whatever-the-weather” Ludlam, Greens spokesperson for Communications, Housing, Heritage, Nuclear Issues, Infrastructure and Sustainable Cities – cosily seated between David “Hot Planet” Marr and Professor Ross “Dog Days” Garnaut, AO – was emphatic: “The weather itself is now a political actor. It influences and shapes political debate.” So ladies, gentlemen: Vote One – Drought. And yes, it was naughty of haughty La Nina to rain on the Rudd-Wong-Gillard-Flannery-etc alarmist parade. If only those cold Pacific currents had been paid more attention by Gaia devotees, perhaps they could have prevented not only a deluge in eastern Australia – one of such prolonged intensity that it silenced the nation’s merchants of fear for a while – but also the removal of a government. Last week John Kerry, US Secretary of State, set the dogs barking again with a limbering-up exercise for Paris 2015 and the 21st UNFCCC Conference of the Parties. An eco-crusader since the 1992 Earth Summit, he told his Jakarta audience that climate change remained the “world’s most fearsome weapon of mass destruction”. [link to full text]. In Perth the day began well. God was in His Heaven. The sun was shining. The dog had been walked without incident. The Dow was above 16,000 again. But things took a bad turn while ordering a late breakfast — double-poached eggs with smoked salmon — just before The Future Traders event. There it was on the UWA Club Cafe menu, a gut-wrenching conjunctio of the sublime and ridiculous: the Club Restaurant is hosting a special event on 29th March – an Earth Hour dinner-by-candlelight – with a glass of sparkling wine on arrival. The Wine of the Month – a Tomfoolery Tally-Ho Sauvignon Blanc – fortunately has a reputation for managing episodes of EH-apoplexy. So it was just what the doctor might have ordered: a tonic with juicy acerbity and an intense bouquet of schadenfreude. Earth Hour is the single largest, symbolic mass participation event in the world. Born out of a hope to mobilise people to take action on climate change, Earth Hour now inspires a global community of millions of people in 7001 cities and towns across 152 countries and territories to switch lights off for an hour as a massive show of concern for the environment. There is no doubt about it: the world is facing some of the most critical environmental challenges in its history. That may make the journey to a sustainable future seem difficult to imagine, but it is far from impossible. Change this big needs every one of us. Together our individual actions add up to make a difference collectively. There was more tomfoolery, too. Earth Hour is moving into another space, one even sillier than its signature “mass participation event” (MPE). Disciples are being urged to “become Super-Heroes for the planet.” In a media release on February 13, Earth Hour – brainchild of the WWF (World Wide Fund for Nature) – announced it had formed a partnership with Sony Pictures Entertainment to coincide with the launch of Earth Hour Blue – and (naturally) Sony’s new movie. Spider-Man will be the first Super Hero ambassador for Earth Hour, with a message to inspire individuals to use their power to become Super-Heroes for the planet. Earth Hour Blue is a “radical new digital crowd-funding and crowd-sourcing platform for the planet”, launched to “engage people around the world and participants in the famous lights-out event.” Readers not gaga over the Sony superlatives will be pleased to learn The Amazing Spider-Man 2 is entirely carbon-neutral. Indeed,Earth Hour Blue’s saving-the-planet ethos had such gravitas the producers, cast and crew team made a vow before Gaia to be “as eco-conscious as possible during production” and “took a special effort to think green and avoid waste”. But I digress. The PWF promo (below) for the other Whine of the Month – The Future Traders — had the whiff of a stage-managed event for the 180-plus capacity crowd. In recent times the Federal Government has moved to abolish four federal climate-change advisory committees and the carbon tax. Yet more extreme-weather events are devastating lives around the world. Is Australia going backwards on climate change? What does responsible action on this issue look like? Only an Extreme Weatherperson with cognitive dissonance could claim there is some kind of (missing) “link” between EWEs allegedly “devastating lives around the world” and government action – while ignoring phenomena such as record snowfalls in the northern hemisphere, the two-decade record for Great Lakes ice cover, a 17-year pause in global surface temperature and so on. 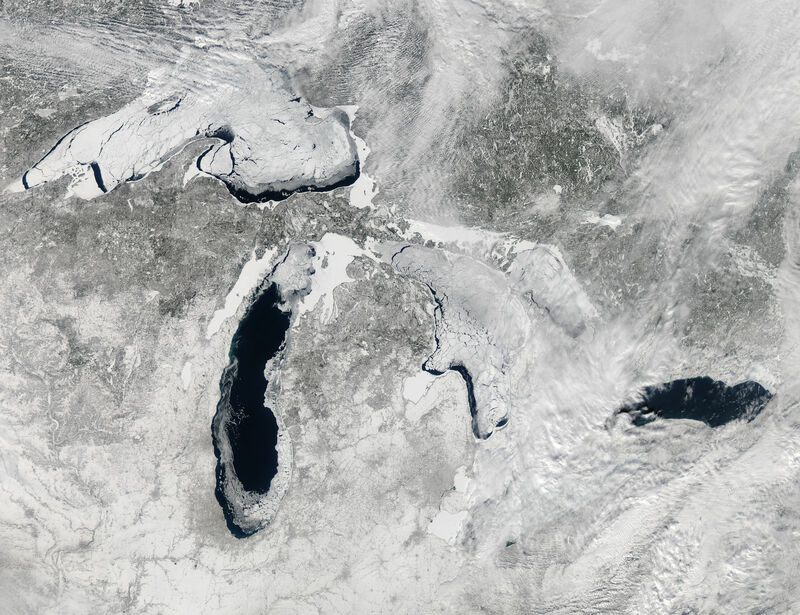 On 22 February, NASA released this stunning image from space showing the Great Lakes are currently 88% covered by ice, due to a combination of unusually low temperatures, wind, and snow. A statement from its Earth Observatory said they have not had this much ice cover since 1994, and have reached just over 50% ice cover on average since 1973. Determined not to be distracted by reality, the panel (predictably) concluded Australia is indeed in real danger of “going backwards on climate change”. As for “responsible action”, it turned out to be retention of all the wacky and grandiose creations legislated by the previous ALP-Green government — the Emissions Trading Scheme, Climate Change Authority, Renewable Energy Finance Corporation, etc. Copenhagen might have been a “diplomatic debacle”, Garnaut conceded, but it was not a failure. Developing countries had made commitments. (But there was no mention of their dodgy “climate debt” claims that had upset a few at COP-20 in Brussels last year. ) The world, he said, was expecting “big steps” in Paris in 2015. Recent comments by Christine Lagarde and the US Secretary of State indicated they wanted a “strong outcome”. Speaking prior to her visit here for last weekend’s G20 Finance and Central Bank Deputies meeting in Sydney, one of the many preludes to November’s full-blown G20 get-together in Brisbane, the IMF head expressed concern about the Abbott government’s intentions. She did not want blood on the boulevards at COP-21. Should the Prime Heretic from Down Under derail UNFCCC’s Carbon Express at this critical stage of the journey, it would be worse than another episode of L’amour Fou starring President Hollande. Malheureusement, international bureaucrats – such as Kerry, Lagarde, UNFCCC Executive Secretary, Christiana Figueres, etc, – are determined to advance their fantasies of global climate-control (and related agendas) by institutionalizing them. The momentum is already building for a big push. On February 27, Figueres will be speaking at the 2nd GLOBE Climate Legislation Summit at the US Senate in Washington DC, where senior UN and World Bank officials will join 100 legislators to launch the 4th edition of the GLOBE Climate Legislation Study. Covering “progress on climate legislation in 66 countries”, it was produced in partnership with the privately-funded UK warmist group, the Grantham Research Institute. The Partnership for Climate Legislation between GLOBE, the United Nations and the World Bank will be launched too: “to support national legislators to develop, pass and implement national laws on climate change and forestry/REDD+”. As for China, Garnaut claimed there had been “a radical change of trajectory in its use of thermal coal.” But however officially committed to reducing AGHGs China might be, the reality is that will remain the fuel for at least 65% of its primary energy needs for decades. Domestic consumption is projected to increase by 50%, from 84 quadrillion Btu to 122 in 2040. Energy generated from this source will double by 2030, with carbon dioxide emissions expected to increase by at least 65%, from an annual six to ten billion tonnes over the next two decades. David Marr: “Everything is at risk of being swept away by the climate-deniers – leaving us with straight marriage, copper wires (NBN) and a hot planet” (laughter). Indeed they are, but as Dr Roy W Spencer also discovered recently, it is hard to believe. “I’ve updated our comparison of 90 climate models versus observations for global average surface temperatures through 2013, and we still see that >95% of the models have over-forecast the warming trend since 1979, whether we use their own surface temperature dataset (HadCRUT4), or our satellite dataset of lower tropospheric temperatures (UAH). “We don’t debate the laws of gravity, do we?” interjected Senator Ludlum to raucous applause, presumably from folk unaware there are no verifiable laws of climate change, merely speculation about them. McHale was unable to throw any light on the panel’s composition or the selection process. Clearly he does not read Climate Etc or testimony from relevant Congressional hearings. And he has also over-interpreted the confidence of IPCC findings. The climate change problem is not at all clear, especially with regard to impacts; the solutions are even less clear.